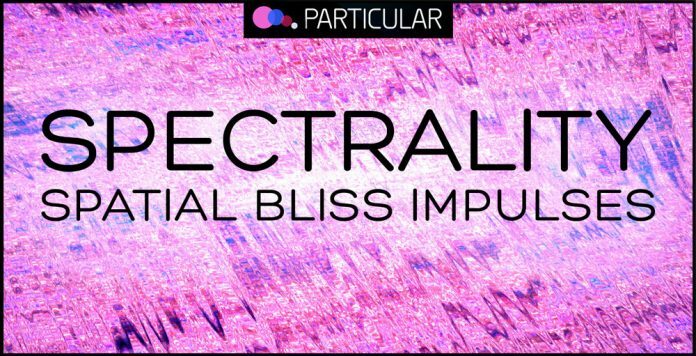 Particular proudly presents Spectrality – Spatial Bliss Impulses. Built upon the knowledge we gathered over the Spectrality AIR libraries we set out to splash the world with fluff and joy. Totally inappropriate and uncool! Suitable for just about any style of music craving a grin soaked in happy colours! Created in the same way as the previous instalments – by playing very short bursts of broadband sounds through a diverse range of hardware effects – we now focused on blissful chords, timbres and overtones. To keep the air, or sometimes artificially insert it, we used the same technique as in the AIR series and sweet spotted every impulses through a set of Pultec clone tube filters, a Clariphonic parallell filter and a set of Rupert Neve Portico 542:s tape saturators to get every impulse into ultimate shape before recording it. Bear in mind that your convolution plugin through this process becomes a combination of reverb, high end equaliser and resonator – creating all kinds of responsive dark and eerie tones, chords and acoustical spaces for your sounds to shimmer through. Also, some impulses have a stronger inherent tone in the broadband noise, so watch your speakers – total alignment in pitch might cause recursive feedback. All impulses in demo are loaded into SIR2 – by Christian Knufinke.